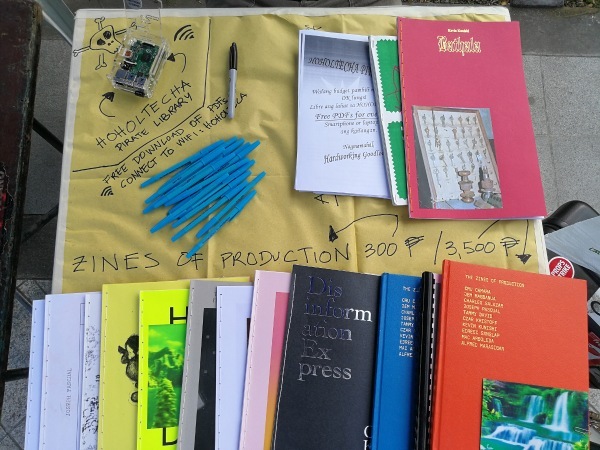 An instance of Bibliotecha was part of The Manilla Biennale Zine Fest. The Filipino instance was renamed to Hoholtecha, as a reference to Xerox Hohol – a series of book pirating parties held in a small coffeeshop located right next to a copy shop on Sucat Road, Manila. The story behind Hoholtecha starts in ZineCamp 2017, where I met Clara Balaguer, a cultural worker based in Manila who was in Rotterdam for a residency in Print Room. She is the founder of Hardworking Goodlooking – design studio and publishing arm of The Office of Culture and Design – and facilitator of Xerox Hohol. When attending one of her talks, it seemed that a digital distribution hub for the pirated publications could work well too. As Clara was interested, Florian Cramer provided a raspi, then Clara and I met for a ‘Bibliotecha session’ after which we had an instance (almost) ready to use – a few details were finished a couple of days after. Clara took the raspi with her to the Philippines, where Hoholtecha did a good job at distributing files at the Biennale. 🙂 Bibliotecha thanks everyone that was somehow involved!